It's been six years since the state established the Kahekili Herbivore Fisheries Management Area in West Maui. Marine experts say it’s a program that’s working, and some fish species are on the rebound. Eileen Chao has more from The Maui News. 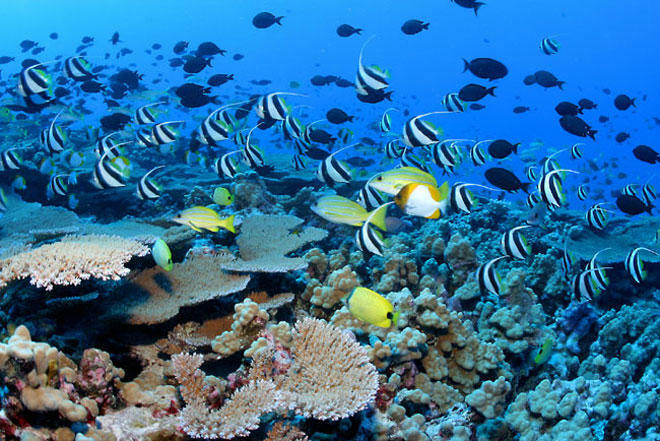 Herbivores like parrotfish, rudderfish, surgeonfish and urchin are critical for the health of coral reefs, as they keep algae levels in check. Without them, algal blooms, especially in the summertime, can suffocate entire colonies of coral reef. That's why conservationists asked the state to set up the Kahekili Herbivores Fisheries Management Area in 2009. The reserve stretches about two miles from Black Rock up to the south end of Honokowai Park. In the protected zone, it is unlawful to kill or harvest any herbivores from the area. Educating the community on the rules and enforcing them hasn't been easy, but the effort is starting to pay off, according to conservationist Liz Foote. She’s worked for more than 16 years to protect West Maui coastal resources. She said preliminary data has shown an increase in the number of parrotfishes and surgeonfishes in the managed area, while the decline of coral cover has stabilized. But she said large-scale recovery for coral takes decades. And that’s why it's important that the area continues to be protected. Seed companies on Maui are conducting business as usual this week. Last week, a federal judge struck down a voter-approved initiative that would have stopped the growing or testing of any genetically engineered crops. But protestors are not giving up. Eileen Chao has more from The Maui News. It’s been two weeks since three men were killed while riding in the back of a pickup truck on Maui. That tragic accident has increased attention on the question of whether new safety laws are needed across the state. Eileen Chao has more from The Maui News. Howard Pruse, Eric Oguma and Tyree Kamaunu were riding in the back of a pickup truck that was turning left into the Maui Raceway Park when an oncoming vehicle sideswiped the truck. All three men were immediately ejected from the truck and pronounced dead at the scene. Governor David Ige was on Maui last week to sign a historic bill about local health care. The measure will allow Maui's three public hospitals to partner with a private healthcare provider. Eileen Chao has more from The Maui News.